You know what would be awesome? A Ghostbusters/Beetlejuice mashup movie! 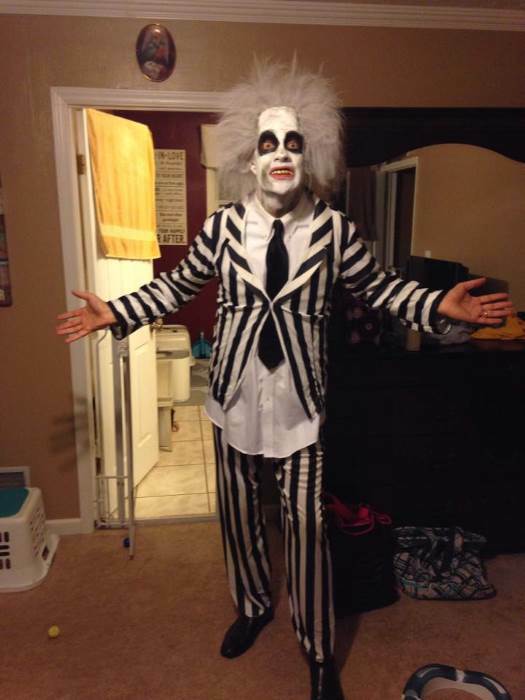 If anyone needed to be eradicated by the famous ghost-fighting squad, it’s Beetlejuice. With his charming ways and slightly immoral motives, he makes for the worst kind of apparition. He was always in the business of preying on the living and the dead, no matter how nice or helpful they were to him. No wonder why it was so difficult to conjure him (how many times do you have to say his name again?). Fathers, you’ll want to lock up your Gothic daughters! The ghost with the most here might stage a haunting that puts the lives of all your business associates in danger just to have a chance at marriage with her. Do you really want a guy like that as part of the family? Probably not. Though he’s a conniving ghost (or demon, or whatever he is), you have to admit, he’s always the life of the party and has wit to spare. You can become the classic ghost this Halloween with our officially licensed Beetlejuice costume. This 100% polyester fabric costume is perfect for all night wear. The jacket fastens with Velcro at the front and the included white dickey has an attached black foam tie. The dickey tucks into the included elastic waist pants and fastens with Velcro at the neck with fabric ties at the waist. 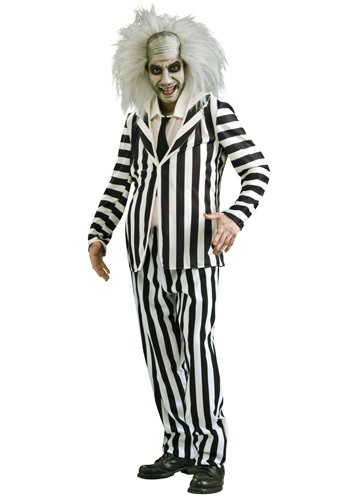 Finish off your look by adding the Beetlejuice wig and makeup kit – you’ll be sure to terrify and offend even the friendliest of ghost allies this Halloween – but that’s what you were going for, right? Great costume. Was the hit of the office party, everyone wanted pictures with me. Didn't wear the dickie though, opted for my own white shirt and black tie. This is a standard size and I am 6'6" 220lbs and it fit perfectly. 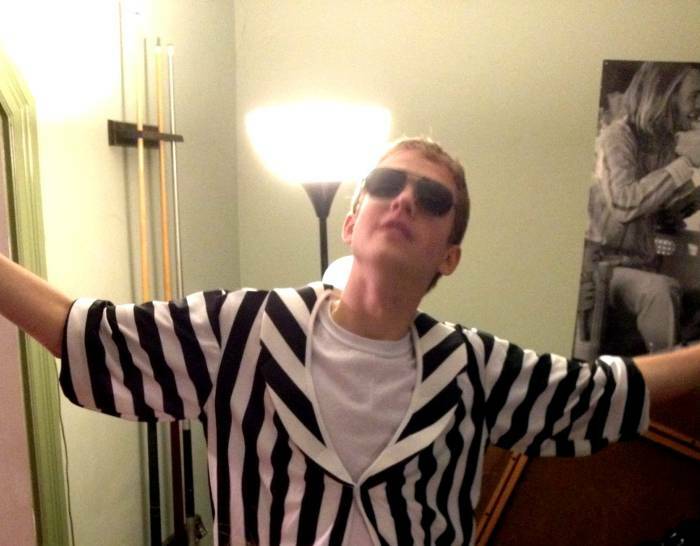 Great Robin Thicke costume look-alike! 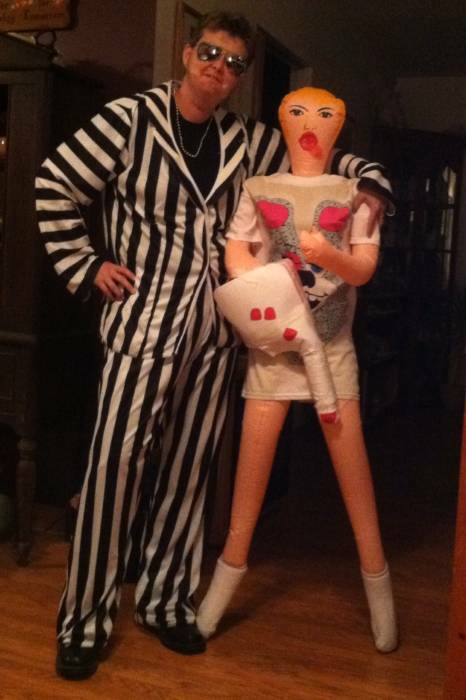 Fun couple costume (girlfriend - Miley Cyrus) and me as Robin Thicke. The pants and over coat ran a little large. Very disappointed in this costume!! It arrived quickly which is the only positive here. Costume arrived crumpled up in bottom of the costume bag. And of course this item is not returnable since it is a discontinued item. I have books and weights on the foam collar and tie, hoping they will straighten out. The rest of the costume is like a cheap, low, low quality fashion scarf. It is very thin. Other costumes I have purchased before were nice. Not sure what happened here. Not worth the $40 paid! Costume arrived crumpled up in bottom of bag. Foam collar and tie are not straightening out. Have had books and weights on them for a week! Rest of costume is made from extremely cheap fashion scarf material. Very, very thin!! Had I seen this in a store, I would not have paid more than $10 for this costume. Cheap quality and misadvertised. Webpage said the outfit fit a chest size up to 52". When we recieved the package, the label said it would fit a chest size up to 46". Highlight was fast shipping. Otherwise would not recommend for someone with large measurements.